[Breakup Files] Did Michelle Ye Break Up With Her Boyfriend? 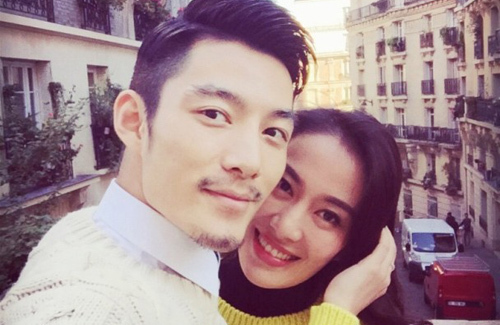 Michelle Ye (葉璇) and her boyfriend, nicknamed “Mr. Xiao Mo” (小默先生), were a sappy pair. Since confirming their relationship in summer 2015, Michelle and her fashion stylist boyfriend consistently showed affection in public, and have been photographed multiple times going out on dates and doing just about everything together. Michelle even shared a screencap of a chat she exchanged with Mr. Xiao Mo, in which she referred to him as “Da Jjiji” (Big Chicken). It’s been two years since Michelle fell head over heels in love with the handsome Mr. Xiao Mo, but just as people were thinking that they were going to last, a rumor about their relationship dropped and started spreading like wildfire—that Michelle and Mr. Xiao Mo have already broken up. Michelle and Mr. Xiao Mo’s last public appearance together was in October 2016, when the couple attended Tavia Yeung (楊怡) and Him Law’s (羅仲謙) wedding banquet in Hong Kong. In November 2016, it was known that Michelle hosted a party for Mr. Xiao Mo’s birthday, as the actress shared a picture of herself kissing his cheek on her Weibo. Now, three months later, a keen-eyed netizen noticed that Michelle has deleted all traces of Mr. Xiao Mo’s existence on her social media. Mr. Xiao Mo also deleted a lot his own posts related to Michelle, leading to the rumor that the two have broken up. It is speculated that Michelle was the one who broke it off first, but is now regretting her decision and is trying to rebuild their relationship. It is claimed that Michelle has been liking a lot of Mr. Xiao Mo’s social media posts and sending him cute emoji messages, hoping to win back his heart. Michelle has not responded to the breakup rumors yet, but she recently updated her Weibo with a post filled with happy faces and heart emojis. 1 comment to [Breakup Files] Did Michelle Ye Break Up With Her Boyfriend? If this is true, I wonder if they will start turning on each other on social media soon?! Now that will be interesting after all the lovey dovey post.